Since the financial crisis, monetary policy has been strikingly different in Canada and the U.S. 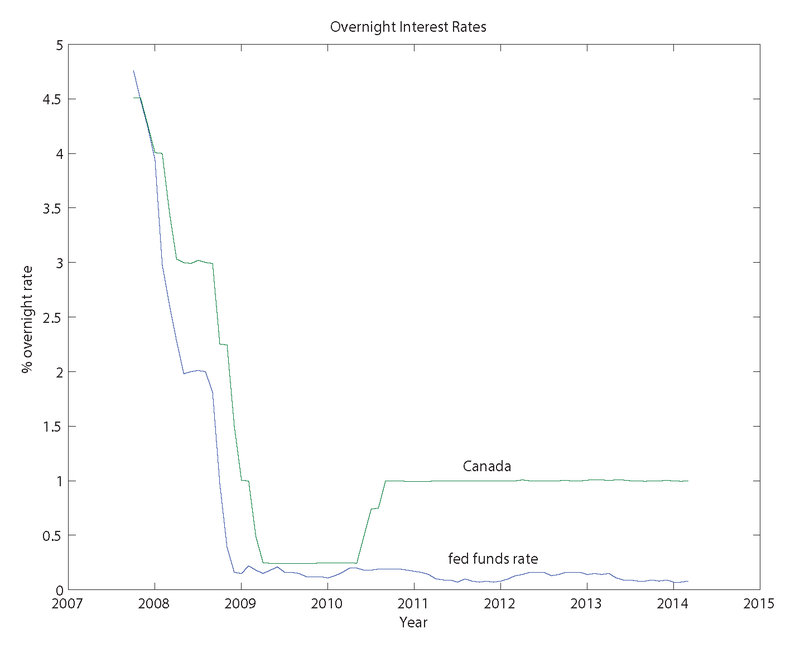 The first chart shows overnight nominal interest rates - the overnight money market rate in Canada and fed funds rate in the U.S. The fed funds rate has been below 0.25% since late 2008, but the Bank of Canada achieved liftoff in mid-2010, and the overnight rate in Canada has been at 1% since then. What about central bank balance sheets? 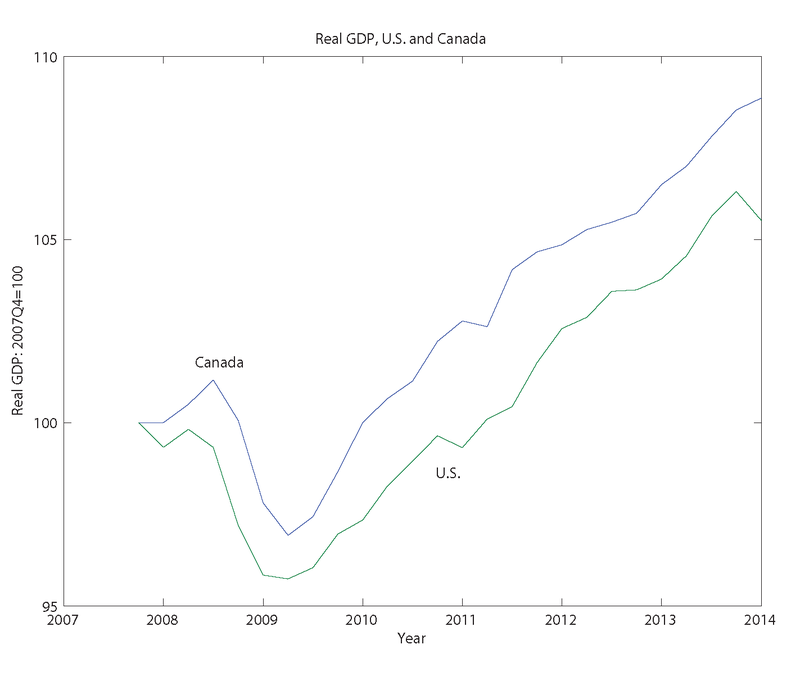 In Canada the size of the balance sheet increased modestly during the last recession, then declined somewhat. 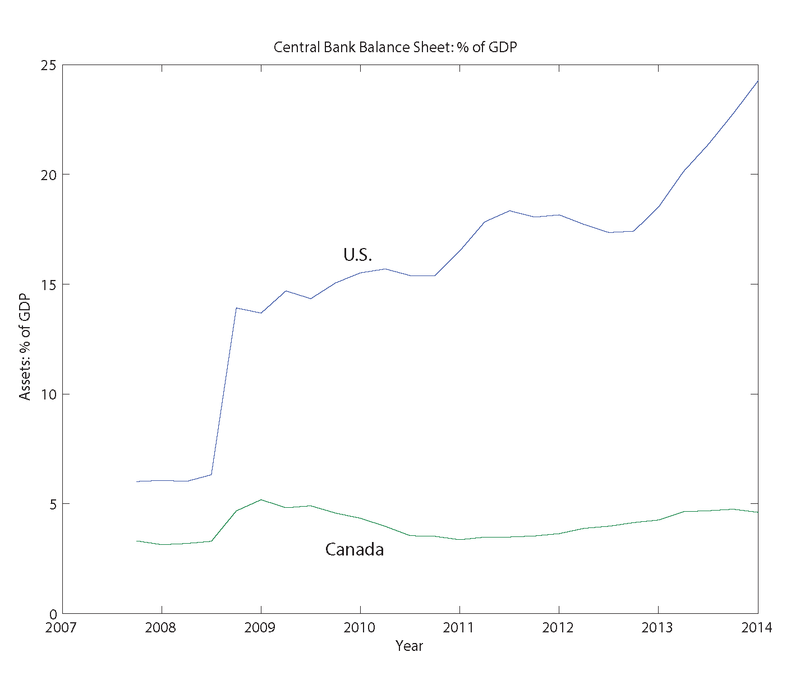 Currently total assets held by the Bank of Canada are slightly less than 5% of GDP. But, as is well-known, successive rounds of quantitative easing (QE) have increased the size of the Fed's balance sheet substantially, to close to 25% of GDP. As is also well-known, QE has lengthened the average maturity of the assets on the Fed's balance sheet. Currently, about 2/3 of the Fed's Treasury security holdings exceed 5 years to maturity, and the Fed holds a large quantity of long-maturity mortgage-backed securities. 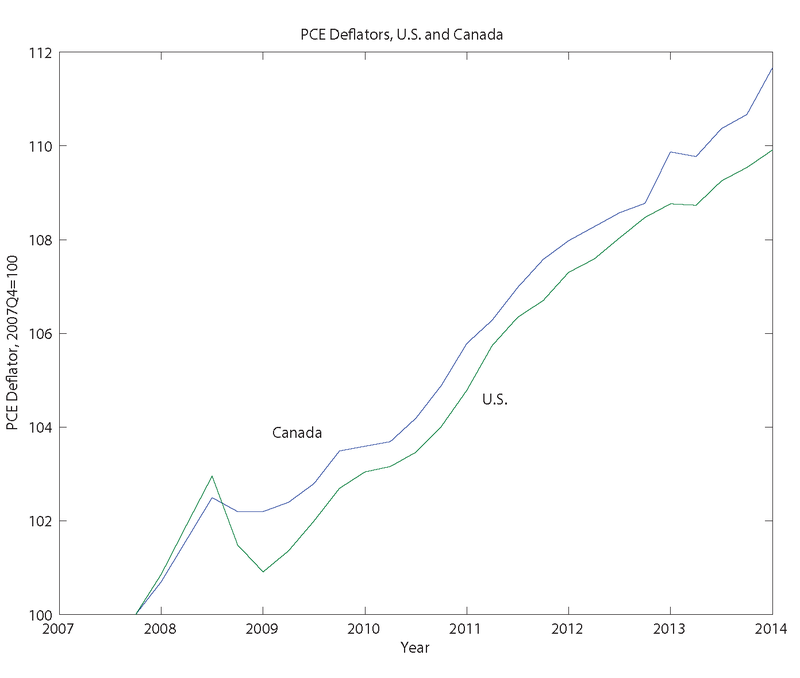 The next chart shows the composition of the Bank of Canada's portfolio of Canadian government debt. 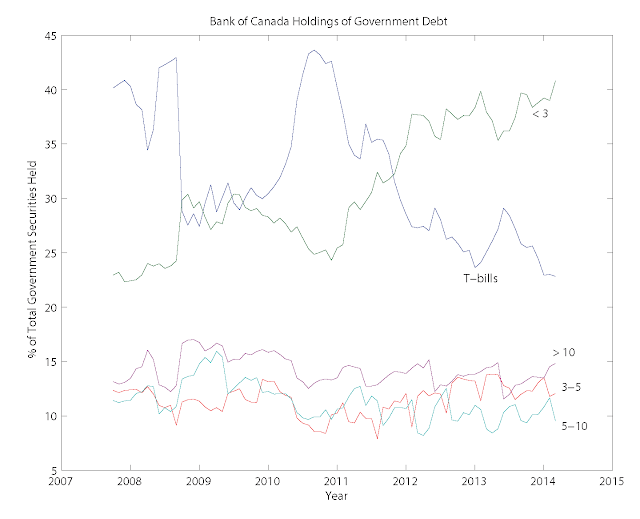 In contrast to the Fed, which has reduced its holdings of Treasury bills to zero, the Bank of Canada still holds a large fraction of its assets as T-bills, though this fraction has come down since before the financial crisis. 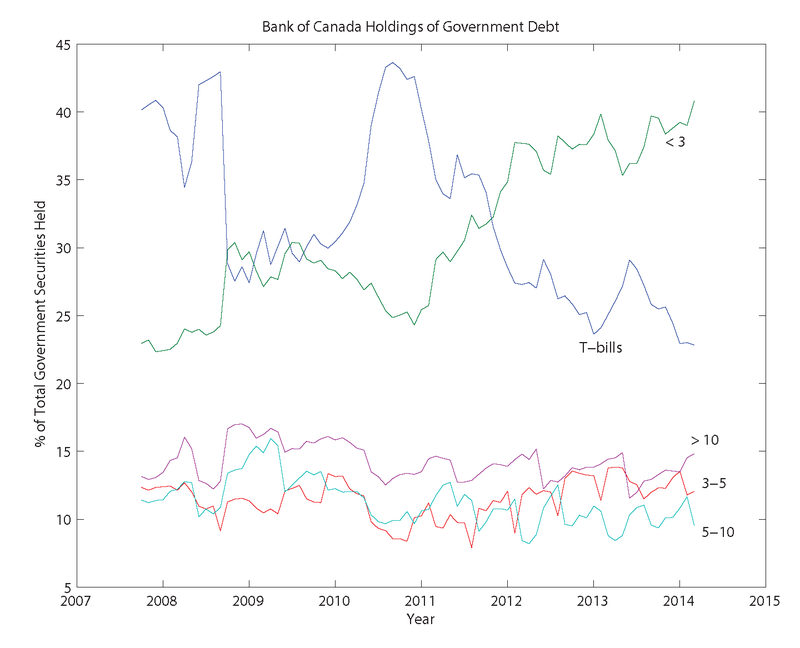 However, most of the shift in the Bank of Canada's portfolio was out of T-bills and into government bonds with maturity less than three years. Before the financial crisis, the Bank held about 2/3 of its portfolio of government debt in maturities less than three years, and that is roughly the case currently. 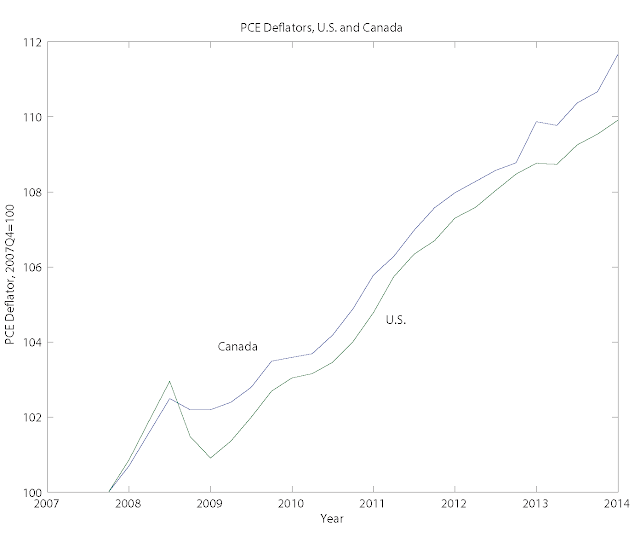 Again, there is a level effect in Canada vs. the U.S., relative to 2007Q4, but in the recovery phase the PCE inflation rate is roughly the same in the two countries, though somewhat higher in Canada in the last couple of years. 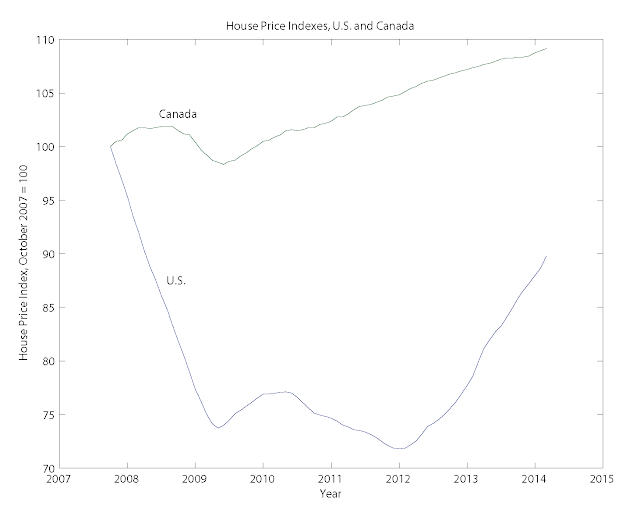 So, if you were to ask your average macroeconomist to back out monetary policy in Canada and the U.S. by looking at the last two charts, that person might tell you that it was about the same. But we know it wasn't. 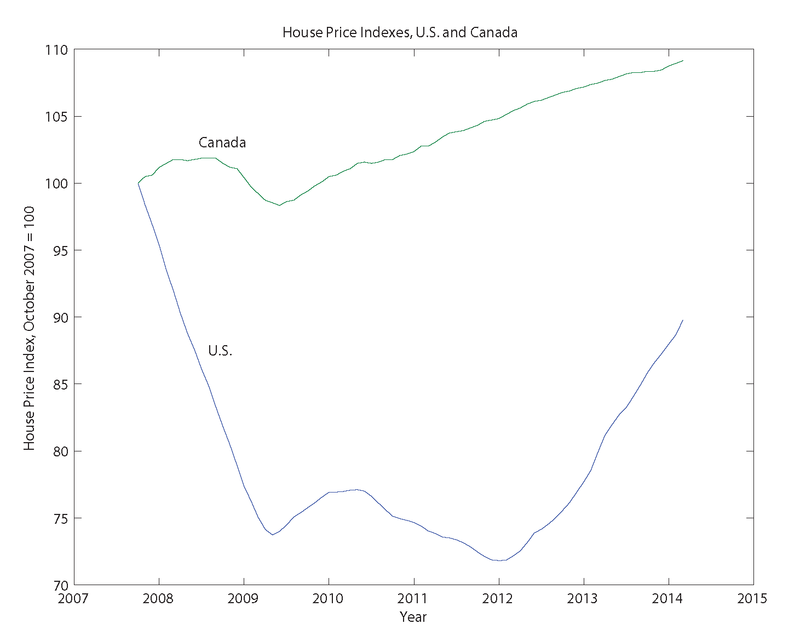 I have seen a lot of stories recently about the effects of monetary policy on asset prices - bubbly talk, basically. 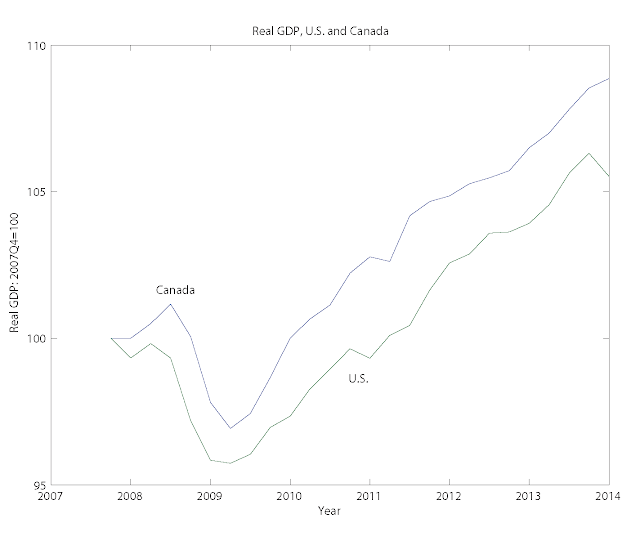 If we take those stories seriously, we might expect to see more asset value appreciation in the U.S. than in Canada. In the stock market, that is certainly the case. 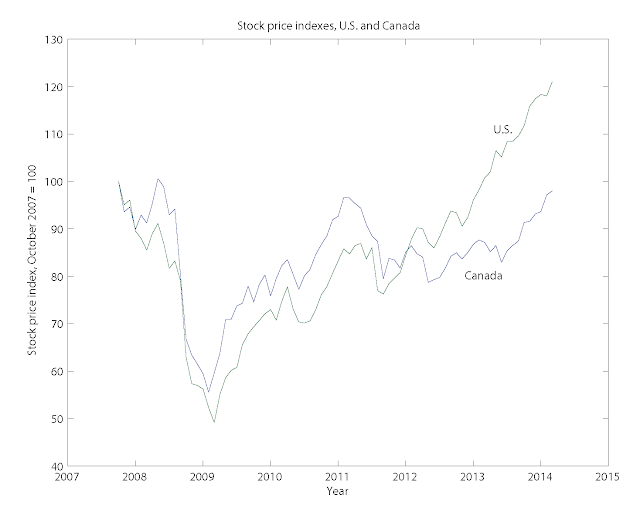 The next chart shows the S&P 500 index, and a comparable measure for Canada. So, maybe monetary policy - conventional or unconventional - isn't as big a deal as some people think it is.